Could Hydro Become Asia’s Backup Battery? As solar, wind and other intermittent renewable energy capacity scale up, hydro’s ‘battery function’ qualities could become an important resource for regional grid stability and reducing carbon emissions. to a future grid dominated by renewables. China is ‘Asia’s1 largest producer of hydropower. In addition to engineering marvels like the Three Gorges Dam, China has countless other hydro projects spread throughout the country. Using US Energy Information Administration figures for 2010, the most recent available, hydropower accounted for 18% of China’s overall net electricity generation. In that same year, by comparison, solar and wind accounted for a miniscule 1% of China’s net electricity production. But wind and solar output are growing at annual rates of 50%+ per year, compared to about 12% per year for hydro. Over time, the rapid growth of wind and solar — and their intrinsic intermittency — may present future problems for China’s electricity transmission and distribution system. Hydropower has a unique capacity to be turned on and off within seconds. This means hydropower could become a premium-priced balancing resource as solar and wind energy expands. In China, as elsewhere, many large-scale solar and wind resources are located far from energy consuming cities. To bring this energy to market, long-distance transmission will be needed. This kind of transmission already has been developed and demonstrated to deliver hydropower, most notably with the US$26 billion Three Gorges Dam. It produces and delivers electricity 2,000 miles away to coastal Shanghai. Many other dams also are located in the center of the country along the nation’s major rivers. As increasing numbers of solar and wind installations are built in northern and western China to deliver electricity to China’s eastern cities, hydropower plants located between the two could offer load balancing. But all of this will require a much more integrated grid. It would also require market reforms that more accurately price distance, availability and carbon content of electricity. In future electricity markets, this more flexible ‘switching ability’ between energy sources may become an important component of grids, which are now largely largely designed to handle point-to-point delivery of consistent power. It’s also worthwhile to stress that hydropower, while cleaner than coal, is more environmentally problematic than wind or solar. Hydropwer does have environmental and social drawbacks — despite its advantages. For instance, construction of the Three Gorges Dam displaced a large number of people. It flooded large areas of river. It has been blamed for silt buildup, earthquakes, methane emissions from rotting vegetation and has disrupted fisheries. Despite this, China plans many more hydropwer dams. So do its neighbors. Burma is planning a multi-billion dollar series of hydropower dams in its northern region to export power to China. Dozens of new dams are planned for the Mekong River. In the shift to a low emission regional economy, therefore, the goal with hydropower — as with all energy sources — will be to get the most amount of electricity with the smallest environmental footprint. Building as few hydropower dams as possible and using them most efficiently is in everyone’s interest. If future electricity networks in Asia are better configured over time to use hydropower for load-balancing rather than for baseload power, two benefits will occur. The first is that markets can better price hydropower’s value to grid stability through more dynamic dispatch auctions for its output. This will produce more accurate price signals for investment, reducing waste. The second benefit is that putting hydropower to its highest economic use may mean fewer dams are needed. That would be good for environmental protection and social stability. China looks well-suited to take on both challenges. China is now building out much of its interior electricity network for the first time, and that offers an opportunity think ahead. China’s infarstructure companies are also some of the most advanced in the world. State Grid, for example, is now operating and upgrading the Philippine grid under a 25-year outsourcing contract. State Grid also recently bought a significant share in South Australian electricity distributor Electranet. Meanwhile, China Southern Power Grid Co. now operates seven cross border interconnections to export electricity to Vietnam . These kinds of projects offer China the opportunity to influence electricity grid technical standards across Asia. Over time, it’s possible to imagine how northeast Asia’s (China, Japan, South Korea) cross-border electricity grids could become better interconnected. For instance, the Tokyo-based Asia Pacific Energy Research Centre has suggested that power lines might one day cross the East China Sea to enable Mongolian wind energy to power Japanese air conditioners. The center noted that such interconnection would be efficient since northern China’s peak power needs come in winter for heating, while Japan and South Korea’s annual peak power needs occur in summer for air conditioning. In Southeast Asia, meanwhile, deeper cross-border interconnection is already moving toward reality. The Association of Southeast Asian Nation States (ASEAN) has developed its Trans-ASEAN Electricity Grid (TAEG) and Trans-ASEAN Gas Pipeline (TAGP) projects. Both are aimed at deepening energy market interconnections between the 10-nation’s national energy markets. All of this indicates a more integrated Asian energy network is taking shape. The challenge is to recognise the pattern, and maximise the opportunities. In coming years, Asia needs trillions of dollars of new energy infrastructure of every kind as the region emerges as the world’s largest economic bloc. Built right, this infrastructure could serve the region well for a century or more and help reduce the devastating regional impact of uncontrolled global warming. This year, (2014) China holds the rotating leadership of the Asia-Pacific Economic Cooperation (APEC) group. Australia has the rotating leadership of the Group of 20. China’s goal for APEC is to spur deeper economic integration. One way to do this would be to create — as China proposes — an Asian Infrastructure Bank. This could fund coordinated energy network interconnection projects between countries. China could also back the Asian Development Bank’s call for Asian energy ministers to develop a long-term roadmap achieving ‘European style’ integration of regional energy markets. Built to common standards, multilaterally managed and operated on ‘open-access, common-carrier’ principles, big new infrastructure in Asia would benefit everyone — regardless of who builds or owns it. 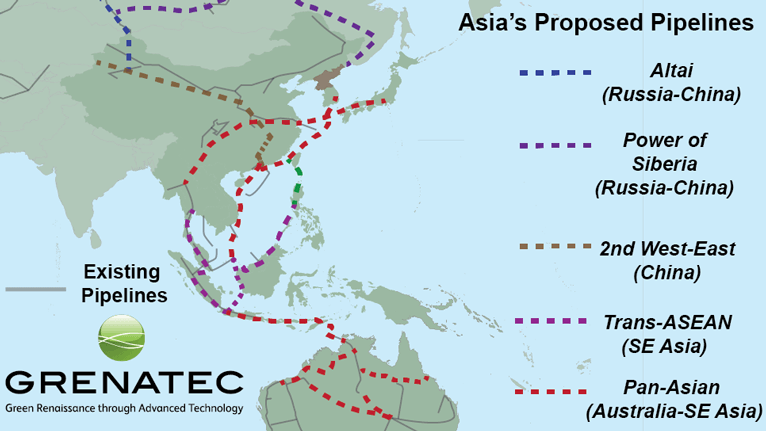 Built for the long-term, this infrastructure could serve Asia well for for a century or more. Done poorly, it could worsen climate change and increase territorial tension and spark war over regional energy resources. Open, inclusive, competitive and innovative energy markets are Asia’s best guarantor of peace, prosperity and environmental protection in the years ahead. Thinking long-term is the key.